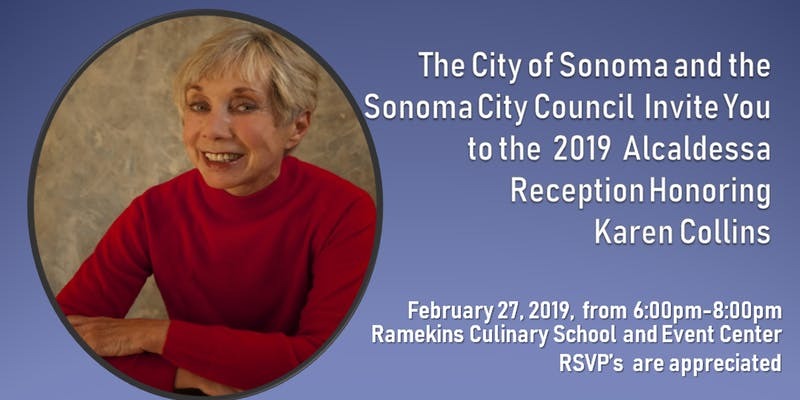 A reception honoring Karen Collins, the City of Sonoma 2019 Alcaldessa, will be held Wednesday, February 27, 2019 at Ramekins Culinary School, Events & Inn, 450 W Spain Street, in Sonoma beginning at 6:00 p.m. The public is invited to attend and participate in the recognition of this devoted citizen, who has done so much for the community. Reservations, though not required, are much appreciated and can be made at https://collins-alcaldessa-reception.eventbrite.com. There is no charge to attend the event; however, donations of $10 are kindly suggested and may be made on the reservation page or at the door.